Royal Canin Veterinary Care Nutrition ranges are precisely formulated for specific needs. Please speak to your vet about these products. 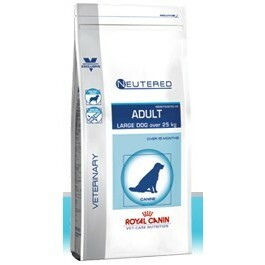 Neutered Adult is a complete feed for large and giant breed dogs (over 25kg) with a tendency to gain weight or joint sensitivity. Suitable for dogs over 15 months old. Helps maintain ideal weight thanks to a low-calorie formula promoting a feeling of fullness. Nutrients which contribute to healthy bones and joints. Ingredients: Dehydrated poultry protein, maize, barley, wheat flour, vegetable fibres, wheat gluten*, dehydrated pork protein, animal fats, hydrolysed animal proteins, beet pulp, minerals, fish oil, soya oil, fructo-oligo-saccharides, psyllium husks and seeds, hydrolysed crustaceans (source of glucosamine), marigold extract (source of lutein), hydrolysed cartilage (source of chondroitin). Nutritional Additives (per kg):Nutritional additives: Vitamin A: 17600 IU, Vitamin D3: 1000 IU, E1 (Iron): 46 mg, E2 (Iodine): 4 mg, E4 (Copper): 7 mg, E5 (Manganese): 60 mg, E6 (Zinc): 199 mg, E8 (Selenium): 0.08 mg - Preservatives - Antioxidants. Analysis:Protein: 28% - Fat content: 11% - Crude ash: 5.5% - Crude fibres: 7.3%.